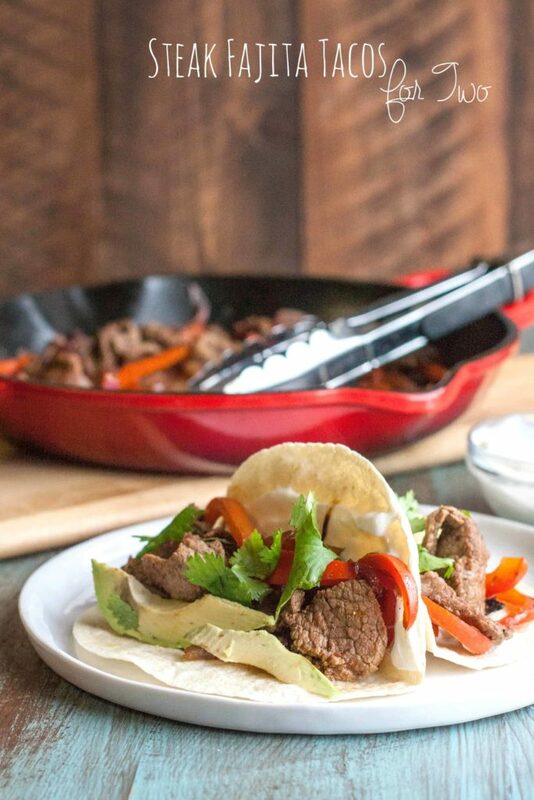 These steak fajita tacos for two are perfect for a date night in or dinner that serves two and comes together in less than half an hour! I come from a family of 6 so dinnertime was always family style…and for 6. When I moved out on my own and even after I got married, it took the longest time to adjust to cooking for fewer people. Even now, I’ll make something that serves more than just my husband and I and we’ll have it for leftovers or I’ll freeze the rest. When I make something ‘for two’ it always feels like a special occasion (like these steak and mushroom sandwiches), and it always reminds me of Christina from Dessert for Two whom I’ve had the pleasure of meeting at ChoppedCon (here is a picture of us – sorry about the blur, I was clearly suuuper excited). 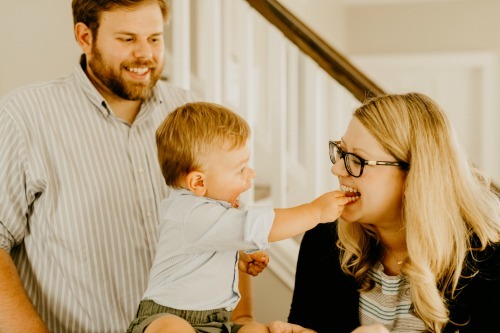 Christina makes small batch desserts, has an amazing cookbook out, Dessert for Two (last week I made peanut butter swirl brownies from her cookbook and they were super delish), she just announced her second cookbook, AND SHE IS EXPECTING her first child!!! So today, as part of a virtual baby shower for Christina, I made steak fajita tacos for two. Christina is from Texas, so I wanted something with bold flavors, and really I couldn’t think of anything more perfect than steak, and tacos. Taco Tuesday anyone? Plus, Christina is due in May, and that always reminds me of Cinco de Mayo! 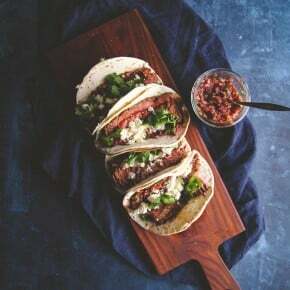 The steak is seasoned with spices and is cooked with onion and peppers (you can add peppers with more heat if you like more of a kick) and is then served with toppings, coming together for the perfect tacos. Preheat oven to 350. 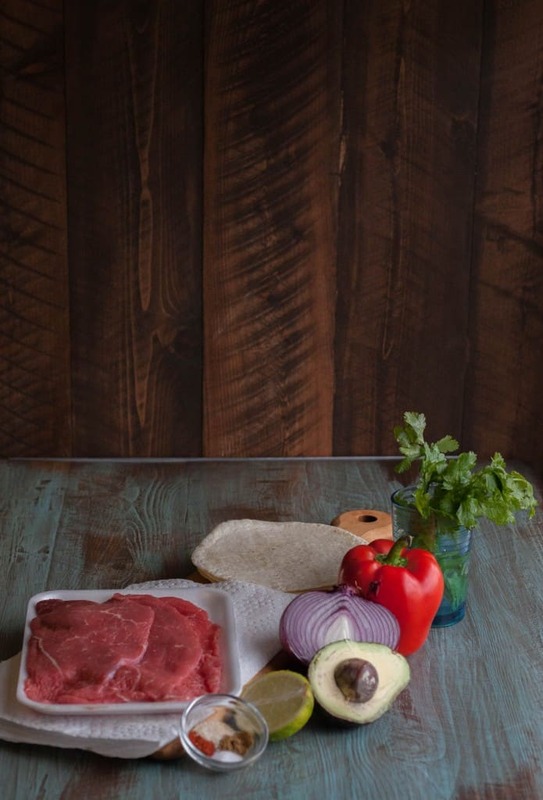 Place tortillas on a baking sheet and set aside. 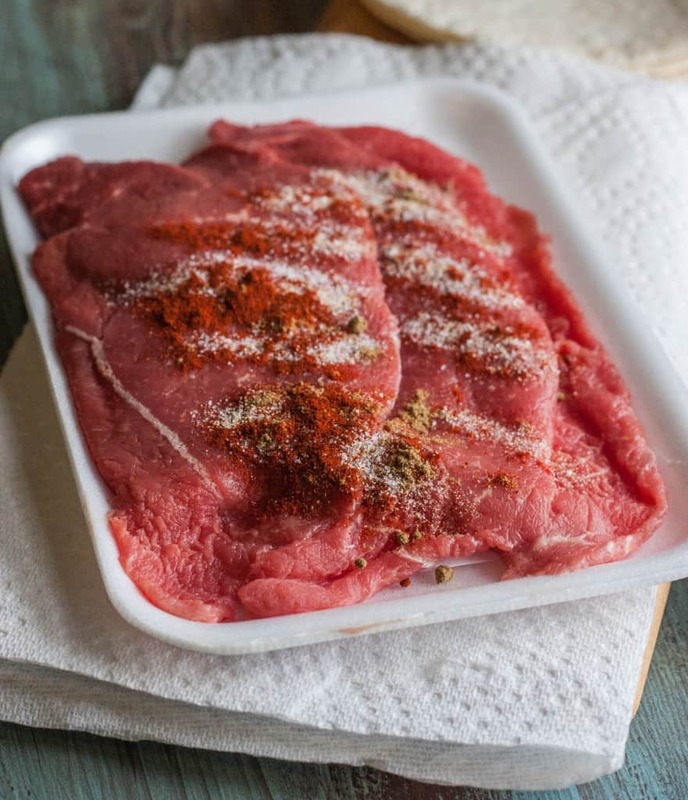 Pat the steak dry with a paper towel and then pat the seasonings onto the steak and let it rest. Heat oil in a skillet, then add the onion and bell pepper slices and saute for 5-7 minutes, or until some edges of the peppers/onions become browned. 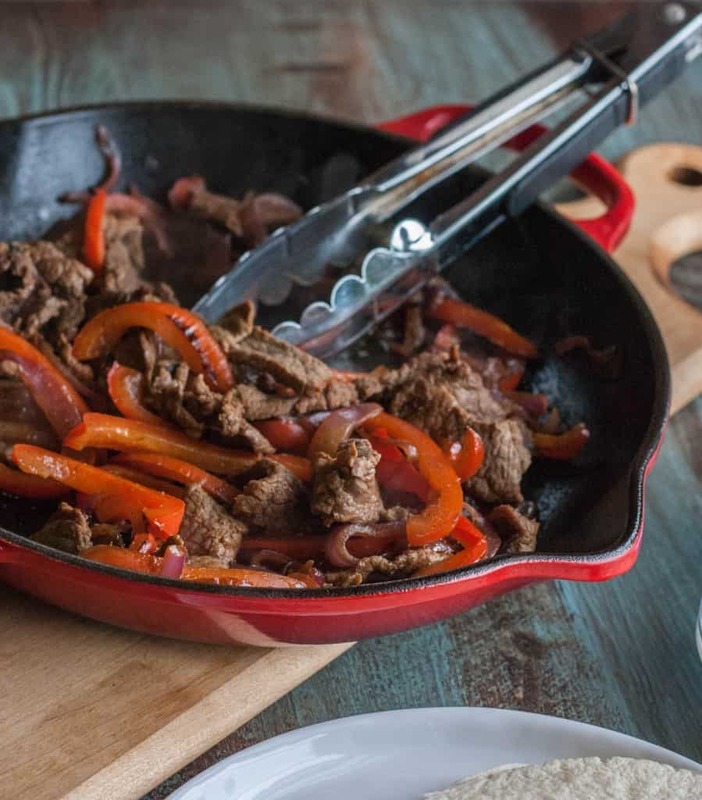 Cut up the steak into strips about an inch wide and add into the skillet with the peppers and onion. 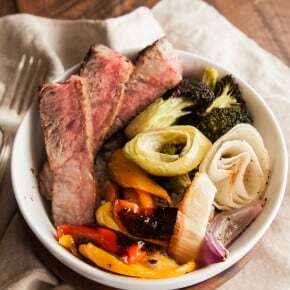 squeeze half the lime over the steak peppers and onions. Cook for 4-5 minutes, until no more pink on the steak is visible. Turn heat off. 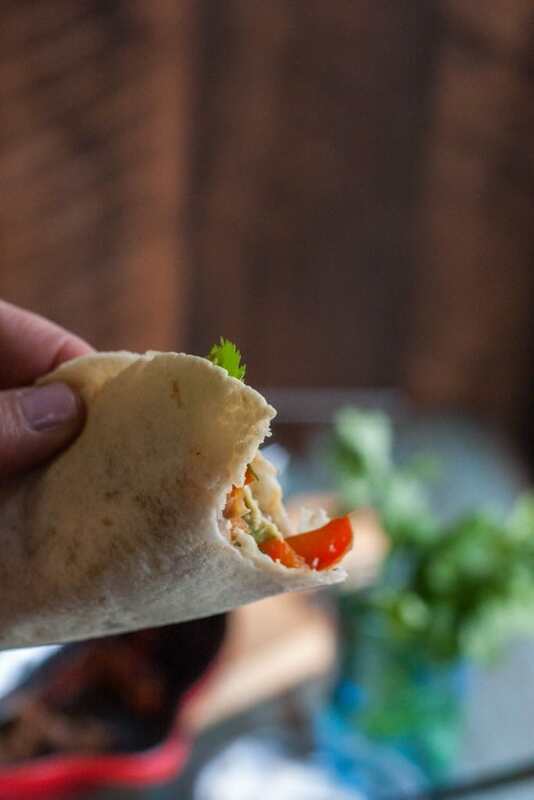 Bake tortillas in oven until edges start to curl up, carefully remove from oven and place on a plate. 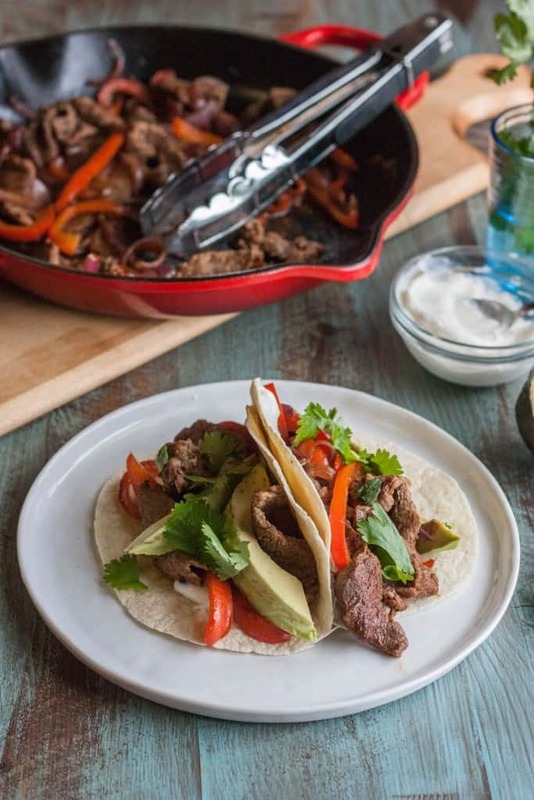 To assemble tacos spread a little sour cream on one side of the tortilla, then add a few pieces of avocado and one fifth of the meat peppers and onion mixture, sprinkle with fresh cilantro and squeeze a little lime over the filling, fold taco in half and enjoy! I like to serve two tacos for me, three for my husband. I’m not the biggest fan of leftovers so I appreciate the smaller portion size here! Sometimes dinner for two are just the perfect amount 🙂 thank you so much for commenting! We eat so many leftovers over here…but I do so love a meal that neatly feeds just two! 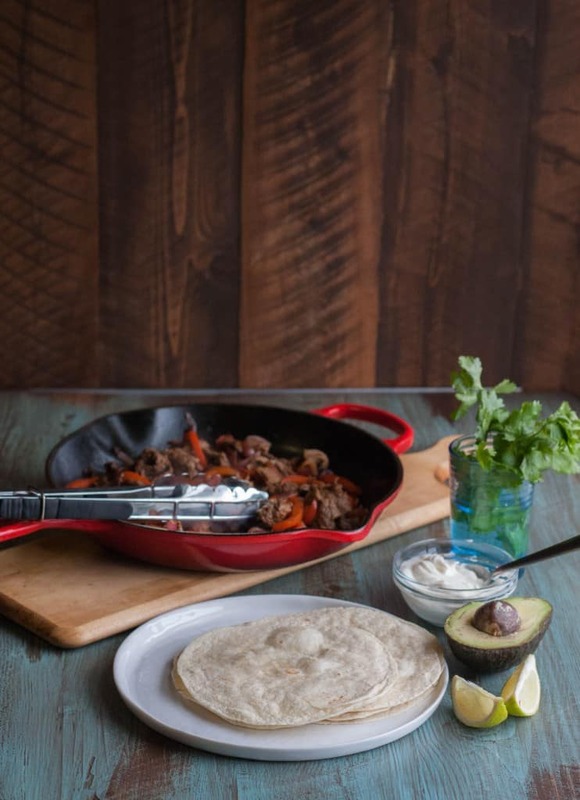 These fajitas look AWESOME. So big on flavor!